This is a recipe I developed several months ago, but with the craziness of life it got lost in the move. This month I was encouraged to dig it out by one of the original recipe testers. So here is it... it has been a big hit with everyone who has tasted them! Preheat oven to 375. Melt dark chocolate and coconut oil on stove top. While it is melting, combine wet ingredients (sweetener and eggs) and add in cocoa powder (it will take a while because cocoa powder is hard to wet and it will be quite stiff). Once somewhat combine add in melted coconut oil and chocolate and stir to combine. Spoon into an 9X9 Pyrex (don't need to grease it, there is enough in the batter). Bake for 25-30 minutes or until a toothpick comes out clean. Allow to cool completely. Once cooled, melt additional chocolate. In a separate bowl pour unsweetened coconut. 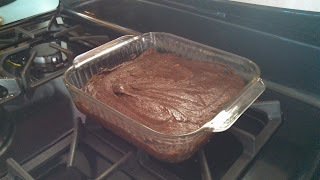 Cut brownies into bite size pieces. One at a time coat brownie in chocolate and then roll in coconut. Place on wax paper till dry. Enjoy! oh man am i glad to see you! lol. Glad to hear from you!